Perfect for traveling and fun for the whole family, this Domino Gift Set features high quality plastic dominoes stored in a padded briefcase. 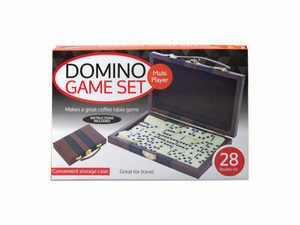 Domino case measures approximately 6 1/4" x 3 3/4". Each domino is approximately 1 1/2" x 3/4". Instructions are included. For ages 3 and up. Comes packaged in an individual box. Box measures approximately 7.5" x 1.5" x 5.125".